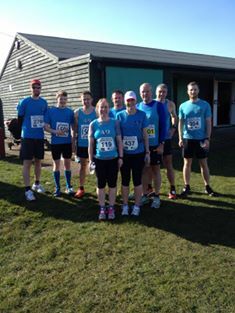 Last Sunday there was a great turnout from the club for the inaugural combined Lydd half marathon and 20 mile. Perfect conditions combined with a pancake flat course made for 6 PBs from the 12 club members running! Steve Hickman was the only member to run the 20 mile finishing in a time of 2:59:08. The rest of A & D, competing in the half, were led home by Kevan James finishing in 1:24:38, well on track for a sub-3 spring marathon! Not far behind were Dean Bracken and Chris Boyce who both ran PBs in times of 1:26:50 and 1:27:23 respectively. Rob Butler finished in 1:30:42 closely followed by a PB from Alan Kirby in 1:35:13. Mark Mullin represented the club for the first time coming home in 1:41:51 whilst Katie McCarter’s time of 1:45:04 was yet another PB! Mark Carlton also running for the club for the first time finished in 1:53:30 whilst Lucy Cresser broke 2 hours for the first time finishing in a PB of 1:55:34! Lastly and by no means least were Julie Foster in 2:15:32 and Tyree Spicer in 2:31:35, the first time Tyree has run this distance! A very successful day at Lydd and many congratulations go to all those that did so well! We should also mention Scott Lynch who continued his comeback in the Sidcup 10 Mile finishing in a time of 1:08:14. Well done Scotty!